Years ago, and we do mean years ago (ugh), we enjoyed some of our first “fine dining” in San Francisco and New York. The food was divine and we really felt transported to an entirely new world. Great fun with lifelong friends, and some of our most memorable experiences. We were also lucky enough to have a few friends who happened to be professional chefs, and they often gave us a little guidance on what a good fine dining experience “should” be. Our friend Chad, once said of a French-inspired fine dining experience, “if you don’t get world-class game, veal or lamb as the main dish you’ve been cheated”. And while we generally agree, the last Michelin 3-star we dined at served goat as the main course.The goat was very, very good, but also a sign that, perhaps, times have changed (or to get 3 stars these days you must be “unique”). Regardless, lamb often seems like a special, restaurant-only dish. But many lamb dishes are very easy to make at home, and the results are truly delicious. The easiest cuts to cook at home are lamb tenderloins and rack of lamb. 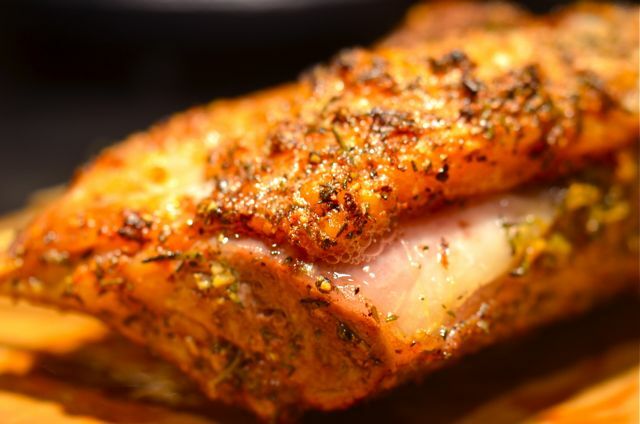 (Lamb tenderloins are simply the loin cut from the rack of lamb- very expensive, hard to butcher and hard to find, but incredibly tender and flavorful. Get them if you can and sear in a hot pan for just a few minutes, slice and serve. Heaven.) But rack of lamb is widely available, attractive, flavorful and a simple dish to make. And the rack is not as “gamey” as other cuts of lamb. So not only is it tasty, but the rack is a good introduction to lamb for those who may be a bit scared by lamb’s reputation for strong flavors. As a bit of a downside, rack of lamb is often pricey, but it’s a special occasion / sunday dinner kind of dish, so we think it’s worth the cost. Also, most lamb in the states used to be imported from New Zealand, but these days many markets feature American grass-fed lamb that is just as good, often better, than imported lamb. 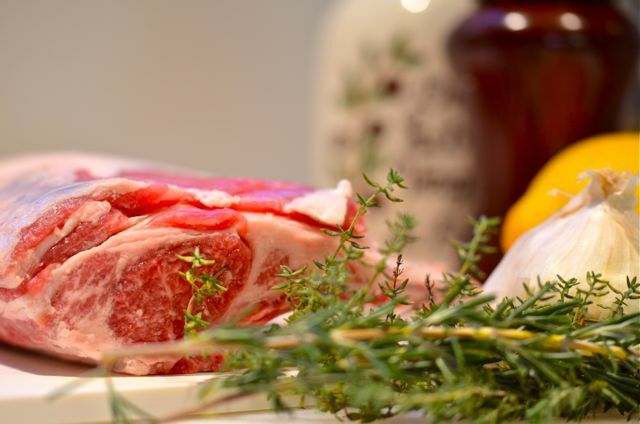 We certainly need to give a plug to our friends the Poncias at Stemple Creek Ranch, their humanely raised, grass-fed lamb and beef are world-class. And domestic lamb is less expensive than imported. Good stuff, and something any locavore can get behind and enjoy. 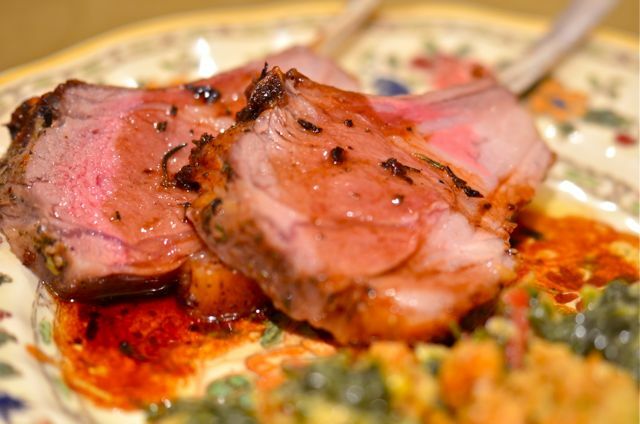 So once you get a good rack of lamb, making it at home is similar to many roasted meat dishes. 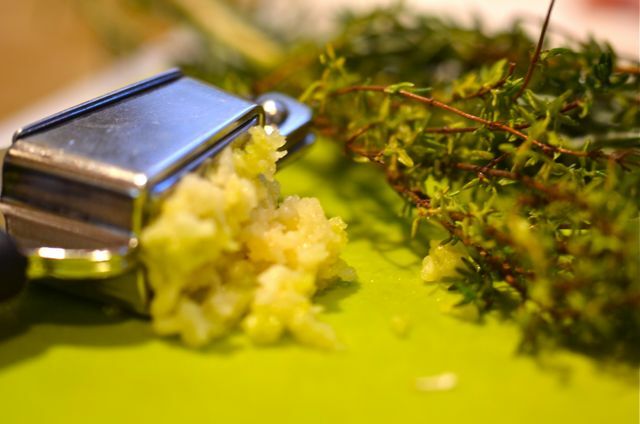 Create a paste of oil, garlic, salt, pepper and herbs (in this case thyme and rosemary). A little citrus zest will brighten the flavor, as well. Rub the herb and oil mixture on the rack and let it sit for at least 4 hours (overnight will be better). Pull the lamb out of the fridge a few hours before cooking to bring the meat to room temperature. The place the lamb in an oven-proof skillet and then roast in a 450 degree oven for 15-20 minutes or until the internal temperature is 125 degrees for medium-rare (yes, a digital thermometer really helps here). Once you hit 125 degrees, pull the lamb from the oven and let it rest for at least ten minutes, then slice and serve. The lamb will look and smell just as good as anything you get at a restaurant. 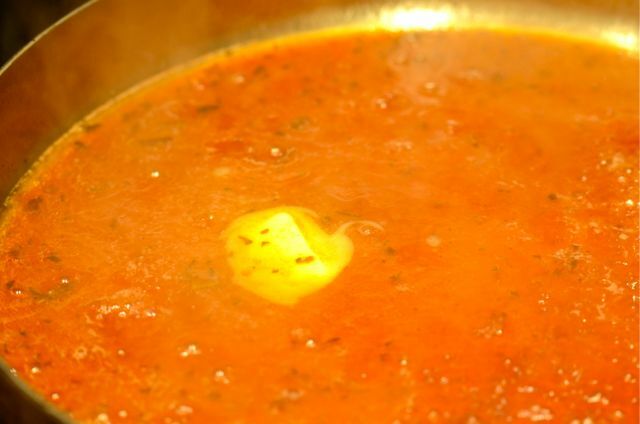 As for a sauce, the juices from the lamb and/or a little Dijon mustard are easy accompaniments, but a real sauce is just a few minutes away. Simply take the skillet you cooked the lamb in (it will be hot, use oven mitts) and remove most of the fat, then place the skillet on medium-high heat and pour in a cup of rich red wine or port. Scrape the brown bits from the bottom of the pan and reduce the sauce by about 2/3. Add a tablespoon of butter and a pinch of salt and you’re done. Pour the sauce over the lamb, or if you want to be super-fancy, strain it first. Either way, you will enjoy a tender flavorful lamb dish that rivals anything you get in a restaurant. Nothing better than “fine dining” at home, and we guarantee you won’t feel cheated. Most racks of lamb are 1 and 1/2 to 2 pounds. A 2 pound rack will feed 2 or 3 big appetites or 4 light eaters. Assume 3 people per 1 and 1/2 pound rack of lamb. If you have small racks, double the recipe. 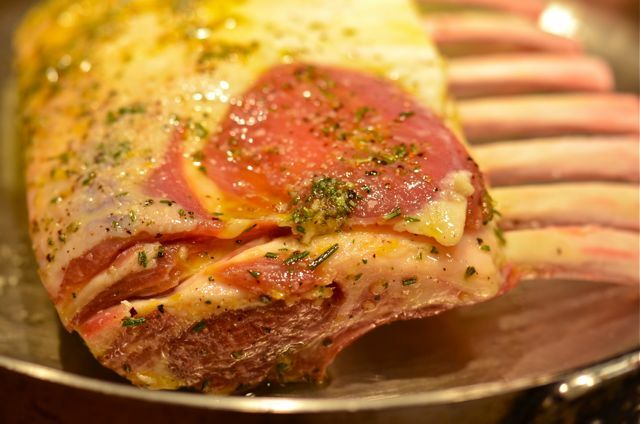 Have your butcher “French”, or cut the meat from the outer section of the lamb ribs. What You Get: A restaurant-quality starter or main course with deep, rich flavor and very tender texture. Also a very pretty dish. How Long? 4 to 24 hours of time, although only about 20 minutes of active time. 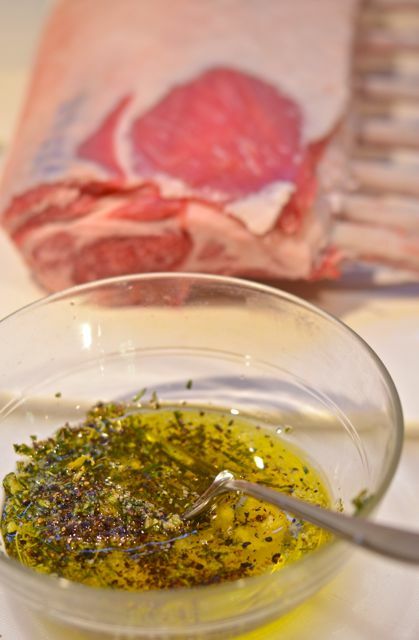 Most of the time is spent marinating the lamb in the oil and herb mixture. Weekend dish. Chop the herbs and lemon zest and then combine in a small bowl with the olive oil, salt and pepper. Mix until combined. Score the outer fat on the lamb and then place the rack in a large plastic bag (or on a large plate). 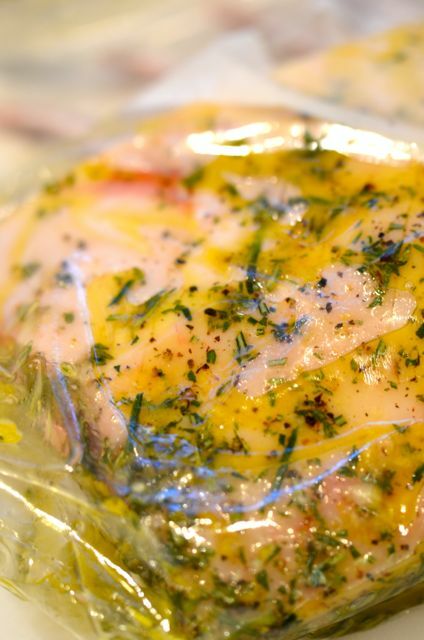 Coat the lamb with the oil and herb mixture and refrigerate for 4 to 24 hours. Remove the lamb from the fridge a few hours before cooking. Position a rack in the middle of the oven and preheat to 450 degrees. Place the lamb, fat side up, in an oven-proof skillet, and put it in the oven. Cook for 15-20 minutes or until a meat thermometer reads 125 degrees in the center of the lamb. Remove the lamb from the oven and place it on a plate or cutting board, cover worth foil and rest for at least 10 minutes. Meanwhile, drain all but 1 tablespoon of the fat from the skillet. 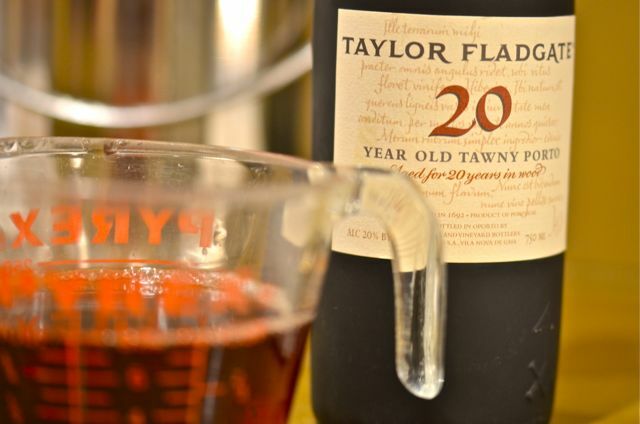 Place the skillet over medium-high heat and pour in the port or red wine and bring to a low boil. While the wine reduces, scrape any brown bits from the bottom of the skillet. Reduce the wine by 2/3, 8 to 10 minutes. Add any juices from the lamb. Then remove the sauce from the heat. Add the butter and stir until combined. Taste and add seasoning. Strain the sauce through a fine mesh strainer, if you like. Slice the lamb between the ribs. Arrange the lam slices on a platter, serve with the sauce. Makes me hungry for lamb at 8am! This looks great. Legs of lamb are one of my favorite meals to prepare. 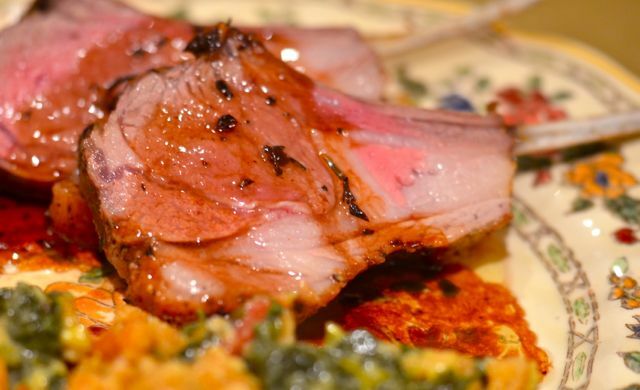 AN inexpensive alternative to the leg of lamb is lamb shoulder chops. Same flavor, significant savings. Perfect for the grill with a Greek marinade. These look fantastic!! Love lamb and yet we never seem to make it often enough! 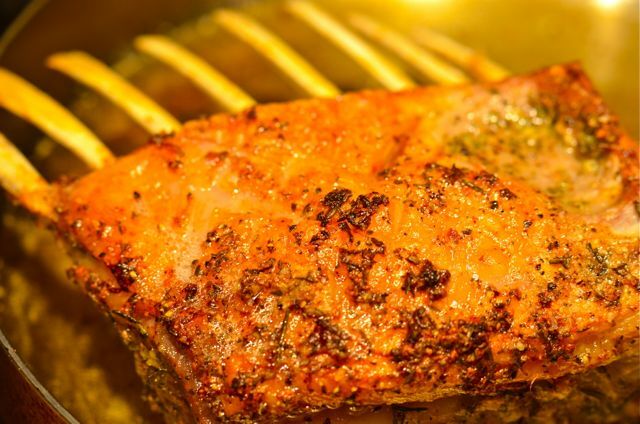 It’s hard to go wrong with a rack of lamb. Some people say that lamb is “gamey,” but I never quite understood that from a lamb-lovers perspective. Seasoned properly, I think everyone can enjoy lamb – even a cheap cut like lamb shoulder for those looking to buy lamb on a budget. As usual, this looks amazing! Rack of Lamb would be my “Last Meal.” I have no intentions of having to plan that whatsoever, so I guess I’ll just have to take this recipe and make a “last meal” before the next meal once every few months. This looks amazing! Your post is making me hungry! Rack of lamb is one of my favorite meats, I love it! Great that you are serving it medium rare. To overcook even less of the outer layer, you could pre-sear on the stove and use a much lower oven temperature (as in, 180F or so). It will take longer of course. Sous-vide has the same effect: medium rare right to the edge. Thanks! It is a very attractive dish. That looks divine! Interestingly, all lamb in Australia is grass fed – I’m not quite sure how else you’d raise it? (75% of our beef is grassfed too). Rack is very expensive here, but would definitely be worth it for such a gorgeous dish – thank you for the recipe! Thanks! Grass-fed is more of an issue w/ beef here (a lot of grain-finished beef in US), but many ranches raise both lamb and beef as they eat different parts of the grass. I am also not sure how else you feed lamb- but happy its grass fed…. 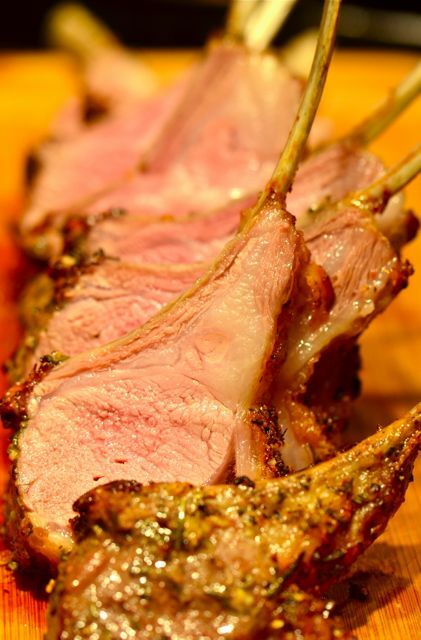 My favorite piece of meat – rack of lamb … I love everything about your recipe. You have cooked it to perfection too. Fantastic. Have never eaten goat – but I can image with the right marinade it will be a great dish. I love also herb and mustard crust on my rack of lamb too. Thanks! And we also like an herb – mustard crust w/ lamb ( ypu may see a recipe sometime). I think I had goat many years ago … in Algeria – it was good – but there isn’t much that can compare with lamb. This looks really good. It is hard to find humanely raised lamb in my area but if you look you can find it. Your rack of lamb looks delicious. I usually sear mine first before putting in the oven. I’m going to have to try your method the next time I prepare it. Hi. The hot oven does give a good crust. Some recipes even suggest 500 degrees to make sure, but 450 works. Normally we would also sear then roast (depending on the rub / marinade), but this works and saves a step. And it looks good. Oh my those photos are fabulous. I need to make this. Pingback: Roasted Rack of Lamb | Never Enough Thyme — Never Enough Thyme - Recipes with a slight southern accent.